Customized email alerts when new jobs are posted for your major, in a particular industry, or by a favorite employer. Download instructions for setting up alerts. Embedded within RaptorLink is CareerShift (search, store and record every job listing at every job board and employer with job postings. Get inside contact information on employees) and GoinGlobal (a premiere platform for accessing information on communities around the world. Access country career guides, USA city career guides, job posting and internship listings worldwide). Access to a national listing of jobs supported by the National Association of Colleges and Employers. RaptorLink has a new look! Download our RaptorLink Student User Guide to help you get started and find your favorite features. 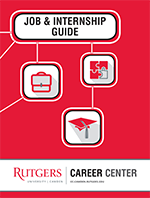 Download the Job and Internship Guide, full of useful advice, sample resumes and cover letters, and much more. Hard copies are available in the Career Center. Want additional assistance? Schedule an appointment with a career counselor by calling 856-225-6046. Appointments must be scheduled at least one business day in advance.